Paige Evans – from South Pasadena, CA --- that's me! Soooo so so looking forward to working with such a talented group of women from literally all around the world! Journaling says: We've been taking Fox to Disneyland pretty frequently since he was only eight weeks old. (Teach 'em while they're young, right?) He seems to really love it! Especially rides with lots of colors, lights, and music like It's a Small World. We know he won't remember ever going, but hopefully he'll see the pictures and layouts and recall the magic of Disneyland. Tips and tricks: So this layout took like four hours to make, no joke. Lots of trial and error! First I created a star in Adobe Illustrator and connected all the points to the center, printed it out, cut out each section, traced the sections onto patterned papers, cut the papers out, then sewed them onto a kraft cardstock background using green thread. Up until now I've only ever used white, cream, brown, or black thread, but I branched out and got a rainbow of colors that I'm excited to use! And let's back up a bit, before I sewed anything down I punched clusters of stars all across the background then adhered some of the stars that were punched out with foam dots and sprinkled in some jewels. 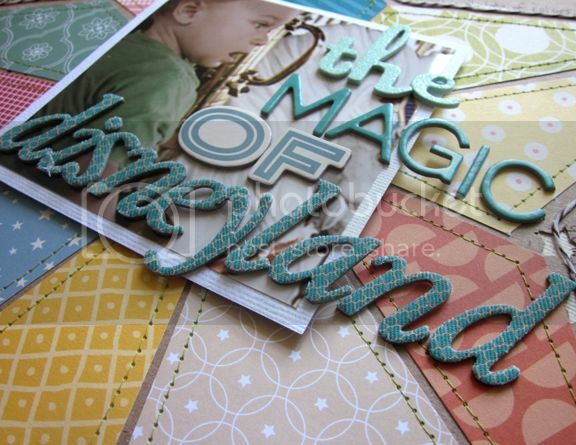 Theeen, I dipped a piece of brown/white baker's twine in Mod Podge, wiped off the excess, and pressed it down around the star to make a border. I wrote the journaling around the baker's twine so it becomes part of the design. Next I sewed on some mini pictures around the edges, added a focal point picture popped up with foam squares to the center of the star, then made my title from Thickers. Piece of cake, haha. 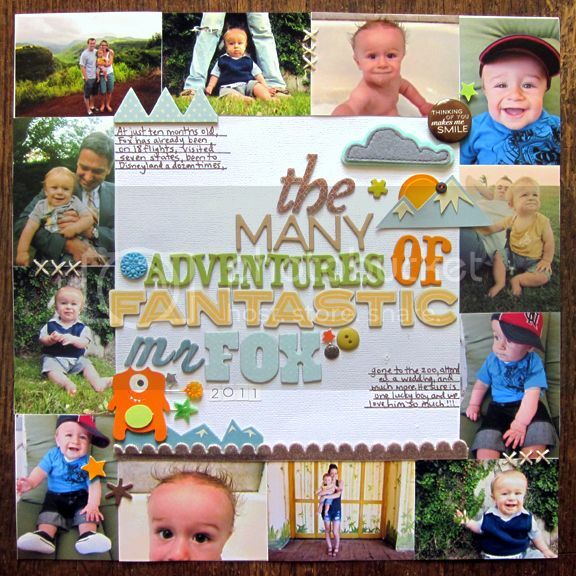 Journaling says: At just ten months old, Fox has already been on 18 flights, visited seven states, been to Disneyland a dozen times, gone to the zoo, attended a wedding, and much more. He sure is one lucky boy and we love him so much!!! Tips and tricks: I started with 12 mini pictures and adhered them around the edge of a white cardstock base. The Thickers title came next then I had fun embellishing around the title with stickers, brads, a button, stickpins, and more. I used a ruler to draw straight lines with a brown pen at the top left and bottom right corners of the white cardstock then wrote journaling. And finally, I stitched some "x"s with cream floss across a few of the photos. They would have been crazy to let you go! :) Congrats!!! wooohooo! HUGE congrats! love these pages! Congrats to you! LOVE your layouts, Fox is just so cute! That star page is just amazing, Paige! I know you'll do more wonderful things in this coming year at AC- what amazing team they have put together for you to work with. I adore your layouts, you little guy is so cute! Um, Paige? That star layout.... IS THE BOMB DIGGITY!!! I LOVE it!! And I LOVE your title work with the Fantastic Mr. Fox!! Awesome!! I CANNOT wait to work with you this year! Eeek! Hi Paige!!! I can't believe all this! It is so incredible! You do GREAT title work. LOVE it! I am so excited for this year. Congratulations! I always love your layouts, and look forward to many more great ideas. OMG both of those layouts are awesome! 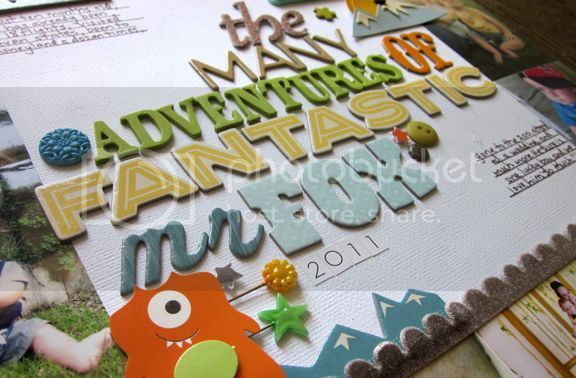 I LOVE LOVE LOVE the many fonts on the Fantastic Mr. Fox page...just adorible. i can not get over how talented you are. seriously. every single time. you amaze me! Hey! I love your posts! I love that Fox gets into DVDS!! Same with Lyssa! What a mess, I hate cleaning it up lol! Those Vacation pictures look like fun! Can you believe summer is almost over? And our Babies are just growin up!! Congratulations! Knew ur blog before and i'm happy u made it! Cant wait to see ur layouts with AC stuff on it!!! thrilled to be working with you, Paige!! You're the best! Congrats on another term with AC! And no surprise that you made the AC team again! You so deserve that ... big CONGRATS! I am super duper excited to be working with you on this fab AC team! Seriously did some dancing when I got the emails from Stephanie and you!Love both of these layouts! CONGRATS & i always adore your work and am so excited to be working with you again!!! Congrats!! Just saw the 2nd LO on 2peas. Love them both! You blow me away with how talented you are! Fox sure is lucky to have a mom like you! Congrats on the AC team! I have to tell you, I love your projects - they are always SO creative! You definitely think "outside of the box" - love it! LOVE LOVE LOVE this LO!! Congrats on making the team--you are super amazing!!! I'm going to say it again...YOU are so creative I can't see straight! I LOVE your layouts. Mr. Fox is one lucky boy to have you as his mama making all his memories come to life! Love these creations and am so happy to be working with you again at AC! CONGRATULATIONS Paige!!!! Big Congrats to you!!!! Your work is always amazing!!! Thanks for popping into my blog Paige:) Congrats on the AC DT gig...that will be great fun. 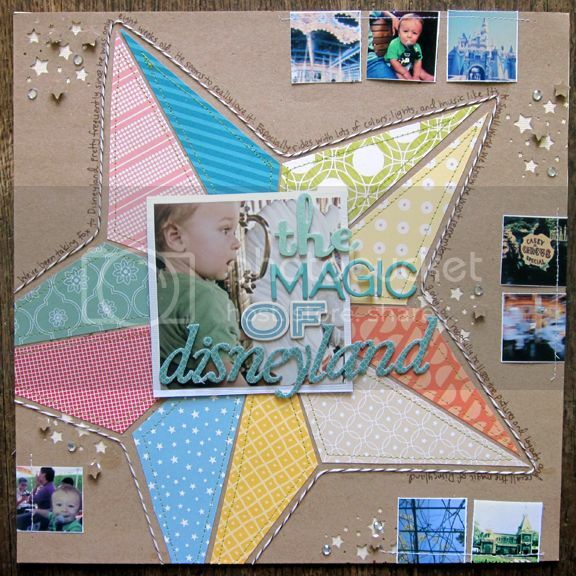 Love that star page with the twine around it....very cool! congrats! such sweet LOs and cute! HUGE congratulations, girl! Woohoo! LOVE these layouts! So many fabulous features to possibly pick a fave! LOVE! Yay!! :) I'm so happy to work with you this year, Paige - your pages are *awesome*!